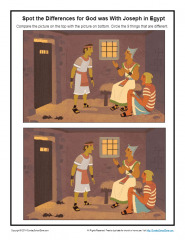 In this spot the differences puzzle, nine differences exist between two images of Joseph talking to two Egyptian prisoners from the story found in Genesis 40. Who among your children can find all nine? Can you also find all nine? Give it a try! Answers are provided.